Harry Styles is dapper in a suit as he hits the red carpet at the world premiere of his film Dunkirk held at Odeon Leicester Square on Thursday (July 13) in London, England. The 23-year-old entertainer makes his feature film acting debut in the flick, which follows the evacuation of the French City of Dunkirk in 1940. Harry was joined at the big premiere by his co-stars Tom Hardy, who was accompanied by his wife Charlotte Riley, Aneurin Barnard, Fionn Whitehead, Tom Glynn-Carney, Mark Rylance and his wife Claire van Kampen, Cillian Murphy, Jack Lowden, Kenneth Branagh, Barry Keoghan, Brian Vernel, and director Christopher Nolan. The film is set to be released on July 21 – Watch the trailer here! Tom Hardy and Charlotte Riley pose for a photo together at the Audi Polo Challenge at Coworth Park on Saturday (May 28) in London, England. The 38-year-old actor and his 34-year-old wife joined VIP guests in cheering on Prince William and Prince Harry at the charity event. Also in attendance were Sam Heughan, Luke Evans and Noomi Rapace, who enjoyed tea before the match and later an evening dinner including a performance by Ellie Goulding. The event benefited charities Sentebale and the Tusk Trust, both of which are supported by Princes William and Harry. Tom Hardy rocks a pair of shades as he hits the red carpet at the 2016 Academy Awards held at the Dolby Theatre on Sunday (February 28) in Hollywood. The 38-year-old shared a laugh with his wife Charlotte Riley while posing for photographs. Tom is nominated for Best Supporting Actor for his role in The Revenant. Tom‘s other film Max Max:Fury Road is also nominated for ten Oscars tonight including Best Picture, Best Director, and Best Costume Design! FYI: Tom is wearing a Gucci suit. Charlotte is wearing a Gauri & Nainika gown. Make sure to watch the 2016 Oscars, hosted by Chris Rock, airing RIGHT NOW on ABC! Chris Hemsworth suits up in gray while attending the premiere of his new movie In The Heart Of The Sea held at Empire Leicester Square on Wednesday (December 2) in London, England. The 32-year-old hunky actor was joined on the carpet by his co-stars Benjamin Walker (with fiancee Kaya Scodelario), Tom Holland, Cillian Murphy, Charlotte Riley, and director Ron Howard. In the Heart of the Sea is based on the 1820 real-life event in which a whaling ship is preyed upon by a sperm whale, stranding its crew at sea for 90 days. FYI: Chris is wearing a Burberry suit and Christian Louboutin shoes. 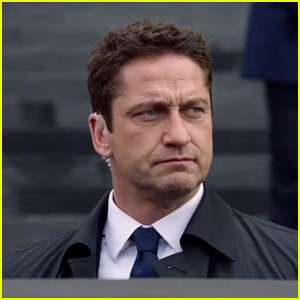 Gerard Butler is reprising his role as Secret Service head Mike Banning in the upcoming movie London Has Fallen and the trailer for the film was just released! The action film has a timely premise: after the British Prime Minister passes away, his funeral becomes a target of a terrorist organization to destroy some of the world’s most powerful leaders, devastate the British capital, and unleash a terrifying vision of the future. The only hope of stopping it rests on the shoulders of the President of the United States (Aaron Eckhart) and his formidable Secret Service head (Butler), and an English MI-6 agent (Charlotte Riley) who rightly trusts no one. Morgan Freeman also stars as the Vice President of the United States. Watch the action-packed trailer below and catch the film in theaters on March 4, 2016. Tom Hardy and his wife Charlotte Riley have reportedly welcomed their first child together, MailOnline reports. The 38-year-old actor and his wife just revealed the pregnancy last month that they were expecting a baby when Charlotte debuted a baby bump on the red carpet! This is the first child for the couple. Tom also has a seven-year-old son named Louis from his ex Rachel Speed. We have reached out to reps for a comment.